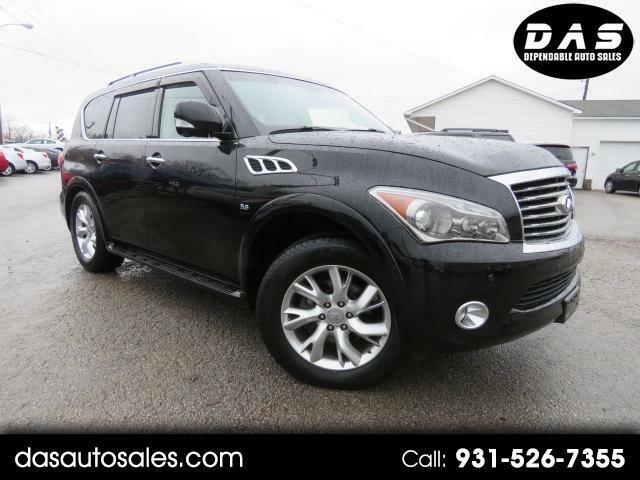 Surround your family with purposeful elegance in our strong and sturdy 2014 INFINITI QX80 4WD brought to you in beautiful Black Obsidian! Powered by a potent 5.6 Liter V8 that offers 400hp while paired with a 7 Speed Automatic transmission that delivers smooth and responsive shifts. Our agile Four Wheel Drive SUV offers a confidence-inspiring drive while also attaining near 20mpg. The eye-catching muscular physique of our QX80 is highlighted by a distinct grille, fog lights, and alloy wheels. Slip inside the well-insulated QX80 cavernous cabin and admire the upscale elements, innovative technology, and attention to detail. You'll be welcomed by the comfort of supportive heated leather seats and automatic tri-zone climate control as you admire the view through the sunroof. Maintain a safe connection to your digital world with rear entertainment system, INFINITI Connect touchscreen display, Bluetooth, voice-activated navigation and a Bose sound system with available satellite radio and iPod interface. Whether pounding snowdrifts into submission to get to your favorite ski slope or breezing through the school drop-off lane, you'll be right at home in our stellar INFINITI that has been equipped with advanced safety features such as INFINITI's Around View Monitor and vehicle dynamic control. Reward yourself today. Print this page and call us Now... We Know You Will Enjoy Your Test Drive Towards Ownership!